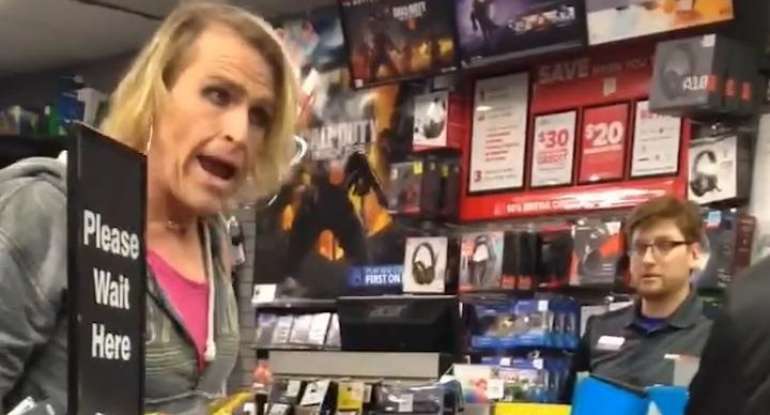 I was recently asked how I would have de-escalated the situation of the angry transgender person in the Gamestop video game store. The incident happened around December, 2018, at least that is when the video and comments began popping up on Youtube. I watched the video a few times, and keeping in mind that I was not there and the video obviously only captures the middle and end of the incident, I came to a conclusion – That clerk, a mere teenager, did the best he could in that situation with an enraged adult who looks to be over 6 feet. Nothing jumps out at me as to what he, the teen clerk, could have done differently to de-escalate the situation in the time frame of the video snippet. I have no idea how it started, what could have set off Tiffany Moore, the transgender in the incident. I imagine that because Tiffany had only recently just started her conversion (based on a news interview with her after the incident) and still appears to be a man with long hair, that the clerk, in an effort to be polite, referred to her as “Sir” while concluding the transaction. Probably simply said, “Thank you for your business sir, have a great day”. Well, Tiffany becomes an enraged, barely in control individual, full of hostility, aggression, foul language and all. A female customer just off camera right, shocked at the verbally abusive behavior, speaks up and says, “Excuse me sir, but there is a young man here and you need to watch your mouth” in an effort to de-escalate the situation. Tiffany blows up at her, telling her “It’s Ma’am!” and telling the lady to mind her own business. Tiffany turns back to the clerk and continues to blow up at the teenager. The video continues with Tiffany continuing to be loud, rude and obnoxious, kicking over a display case and then demanding the phone number to Corporate. All the while the clerk is staying calm, using a low tone, calm tone of voice, trying to apologize, trying explain himself, trying to be accomodating and looking up the number to Corporate, trying to de-escalate. There is nothing else the clerk could have done differently. When people get to that point of agitation, there is often times nothing that you can say or do that will make a difference. Based on what I could see on the video, which is only a little over a minute long, the clerk tried everything I teach in my conflict de-escalation training seminars. The clerk did not have an aggressive or defensive body posture, he used a low tone of voice, a calm voice, he apologized, he tried to explain himself to Tiffany, he tried to be accomodating with the request for corporate’s phone number. The clerk tried to keep the peace, he did not demand that Tiffany calm down or shut up or leave the store. That teen clerk tried to de-escalate. Apparently Tiffany did not get any sympathy from the transgender community, as there are several videos on Youtube by transgender persons who condemn Tiffany’s behavior and actions. In an interview with local news Tiffany commented that she would do it all over again the exact same way because her actions were “justified”, that it was “hate, a blatant and malicious misgendering”. Sometimes nothing you say or do will make a difference. An agitated person will either be too agitated and upset, or intoxicated by drugs or alcohol, or have made the decision to create a scene for attention and drama. I have dealt with all of those types of persons. But I am telling you from 20 years of experience, if you are aware of your ACE, and in control of your ACE, you are more likely to successfully de-escalate a situation with a difficult person. ACE is an acronym I came up with and stands for Appearance, your body language, facial expression, body posture, Communication, your tone of voice, the words you use, how you use them and say them, and Engagement in the moment, are you really listening to the other person and using active reflective listening? This young clerk did the best he could in a tough, scary, stressful situation, and I for one think he did great and there is nothing he could have done differently in this situation with Tiffany.